We have a strict 48 hour cancellation policy from the date of arrival. No changes in reservations can be made within the 48 hour window. No shows/cancellations/reductions in number will still be charged full price. For group bookings over 5, cancellations made less than two weeks in advance, will be charged 50% of their total reservation costs. PodShare is a drug free facility, and we do require that at least one staff member remains on site for security. We ask that a credit card be held on file for any damages or incidentals. 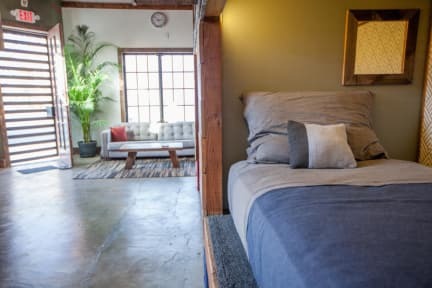 Podshare is a co-living space in the trendy Los Feliz/Silverlake area featuring 10 pods in an industrial loft style space. If you love interior design, small communities, and local neighborhoods, you MUST co-live at PodShare. 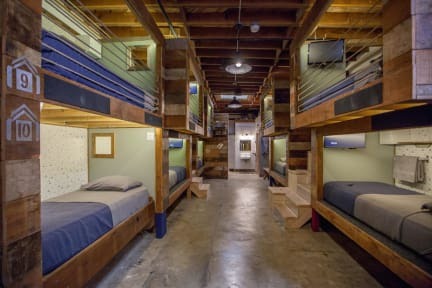 As a PodShare guest, you are welcome to visit our other locations from 10am to 11pm for the duration of your stay (DTLA and Hollywood) to co-live, co-work, and enjoy the shared amenities like bikes, showers, lockers, WIFI, computers. Check us out on Vice, Curbed, LA Weekly, LA Magazine, KTLA - we are all over the net right now! Podshare Los Feliz is central and convenient to ktown, downtown, Hollywood and the valley. 8 min walk from Sunset/Vermont Metro line. Within walking distance: Vons supermarket, Kaiser Permanent, the historic Vista Theater, coffee shops like Dinosaur Coffee, Bru or Caffe Vita, 1 mile from LA City College, Sunset Junction, and Griffith Park (Observatory, public tennis courts, horseback riding, and the Hollywood sign). Each custom built pod features its own flat screen TV with Roku (Netflix, Hulu, Pandora), dimmable LED lighting, outlets and locker. Enjoy a spacious shared kitchen and dining area. The floor plan is designed for sociability and security, and we have teammates living in the space to answer all of your questions. Taxes not included - occupancy tax 14.00 % per room per night. Breakfast included (Cereals, milk, bread, jams, etc). We do not accept customers younger than 18 years of age. No children allowed.